We’re moving my Mom this week to an assisted living facility. While her health is good, her mind is slipping away. It’s hard to believe just a few months ago we were talking about traveling together to Poland and the Ukraine to see the towns her parents emigrated from. There’s no chance of that anymore. She always said she was going to learn how to play bridge and mahjong. She never found the time, and now it’s never going to happen. 1. Live like you’re dying. If you operate as though today is the only day you have left, you’re more likely to do what really matters. It means you should keep death in the back of your mind at all times. I know that sounds morbid, but it actually reminds me to live. 2. Spread some love. If you have unresolved issues with someone, right now is a good time to let it go. Make the call. Have the conversation. And tell everyone you love that you love them. It’s not enough just to show someone, go ahead and say it. Not only will it eliminate regrets, but you’ll feel amazing and so will they. In the end, what matters besides the people you love? 4. Stop working so hard and start making memories. It’s important to make a living, but don’t mistake work with having a life. The people you love and the experiences you have in your life are far more important than work. 5. Develop hobbies. My Mom’s whole world revolved around her work, and she never developed any hobbies. By the time she stopped working, she didn’t have anything to take its place. Spend more time making good friends and great memories. What did you like to do when you were a kid? Puzzles? Play cards? 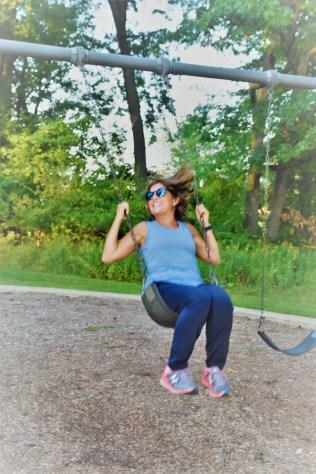 Swing on a swing set? Go do that! Learn how to play bridge while you’re still sharp enough to learn the game. 6. Keep moving. While my Mom’s mind may not be sharp, she is physically fit. She never stopped moving. It motivates me to exercise on a daily basis. You’ll never regret a good workout. 7. Get uncomfortable. If you want to live a life without regrets, you have to be willing to do the uncomfortable things it takes to achieve your dreams. Take a risk. Do something you think you can’t…every day. 8. Let it go. If someone ticked you off, life’s too short to hold onto it. My Mom actually taught me that. It’s one regret she’ll never have. She forgave everyone. 9. Be nice. My Mom must have said on a daily basis: “For the same price you can be nice.” You’ll regret being mean to someone, but you’ll never regret smiling or being kind.